After eight hours of racing at the world-famous Sebring circuit for the FIA World Endurance Championship teams, it was the #8 Toyota TS050 HYBRID that scored a dominant victory. Fernando Alonso, Kazuki Nakajima and Sebastien Buemi were almost faultless in the race. Nakajima was in at the end and crossed the line under safety car conditions with the rain coming down in the final 30 minutes, over a lap clear of the delayed sister #7 TS050 which lost time in the pits after Jose Maria Lopez had an off midway through the race. It puts the #8 crew in the driving seat to win the World Drivers’ title with two races to go. The LMP1 privateer runners were never in the fight on this occasion, the disparity as huge as ever between the hybrid and non-hybrid machines on the notoriously gruelling airfield circuit. The #3 Rebellion looked set to claim the final podium spot after a mostly clean run, but had issues late in the race and was beaten to third by the the #11 SMP Racing BR1 (which did well to recover from an early puncture, and finished 10 laps off the winning car) in what was a race of attrition for the LMP1 class. Only four cars finished in LMP1 after the #17 SMP Racing BR1 crashed out at Turn 1, and the #1 Rebellion R-13 and DragonSpeed BR1s retired with mechanical issues. In LMP2, it was Jackie Chan DC Racing scoring its fifth win of the season, however, its championship-leading #38 car of Stephane Richelmi, Gabriel Aubry and Ho-Pin Tung didn’t score maximum points here. Instead, the new-look #37 crew of Jordan King, Will Stevens and David Heinemeier Hansson proved untouchable and won on their first race as a pairing. It was also the first win in WEC LMP2 competition for both King and DHH. 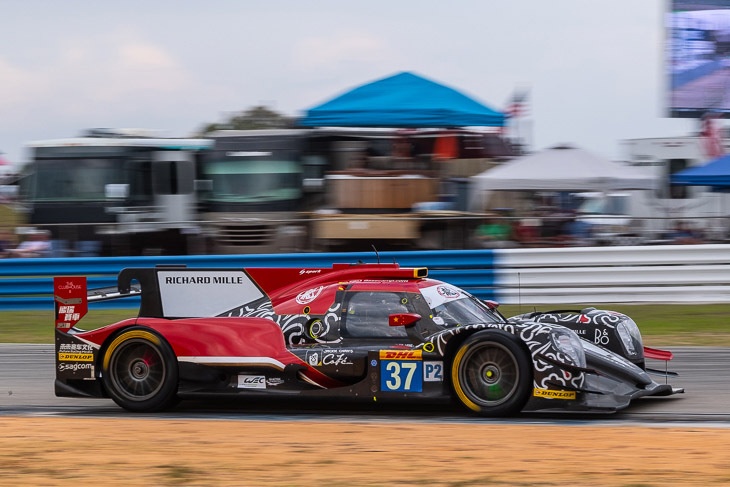 The aforementioned #38 ORECA suffered a major title blow, after suffering major electrical and transmission issues early in the race, and later needed to have its driver door replaced. The car finished, but last in the class. While the #38’s title rivals in the Signatech Alpine A470 didn’t win, Nicolas Lapierre, Andre Negrao and Pierre Thiriet did collect a strong haul of points by finishing second, taking the lead in the points standings in the process. Completing the podium was the DragonSpeed ORECA, which recovered well after a tough outing. The crew was in the wars throughout, suffering tyre issues and lost time due to offs into barriers, but still earned silverware thanks to other runners in the class falling even further back from the winning car. Racing Team Nederland’s Dallara looked most likely to take a podium during the first half of the race, but it all unravelled for the Dutch squad after losing 12 minutes in the pits in the final third. 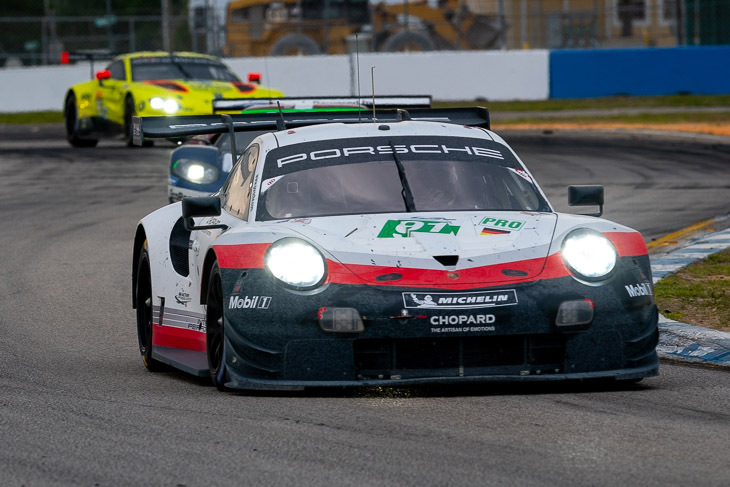 True to form the GTE-Pro class went down to the wire at Sebring, but with an added twist provided by the weather. The rain was predicted but held off until the last 30 minutes of the 8-hour event, meaning the result was as much down to pit work as it was to car and driver performance. The usual suspects at Porsche and Ford had new company at the front as the BMW Team MTEK entries had a strong race, the #81 M8 GTE, in particular, leading significantly in the latter part of the 8-hour race, its sister car also in contention earlier on. Ironically though, the wet conditions that had delivered the M8 GTE’s first victory at Daytona a month ago were to work against them as the #91 Porsche 911 RSR of Gianmaria Bruni and Richard Lietz stole the victory under full course caution. It was the pole-sitting #92 Porsche of Kevin Estre that led away, challenged hard by the #67 Ford GT of Andy Priaulx that became a strong leader in the first half of the race and looked to be in control as strategies panned out. The #67 car had pulled an advantage from the closely grouped chasing ‘Pro field until caution periods spread the order. These were short and well-managed and there was only one safety car intervention until the rain came. Antonio Garcia showed well in the first stint for the lone Corvette but the car soon faded, Jan Magnussen and Mike Rockenfeller looking out of touch with the race. Similarly, the Aston Martin Vantages had lacked any real qualifying pace and although the #95 car ran in the top five in the middle of the race their performance was disappointing considering their win in Shanghai. That neither Aston Martin nor Corvette attended the Sebring test may be significant. As the track was declared wet with 30 minutes to go the dice were rolled; any fuel strategy affected by lack of caution periods suddenly needed a re-think in the downpour. This was unfortunate for the #81 BMW of Nicky Catsburg, Martin Tomczyk and Alexander Sims, who had needed a late splash to redress their pace at the front, and now needed tyres too. The #91 Porsche, which had also run hard in the leading group throughout, took to the pits at the wet tyre stops which the Porsche pit crew simply executed quicker, allowing Bruni to pass the BMW in the pits just before the Safety Car was deployed and under which the result was declared. Dempsey Proton Racing took the Am victory, Matt Campbell celebrating a second trophy in an endurance classic to go with his Bathurst silverware. 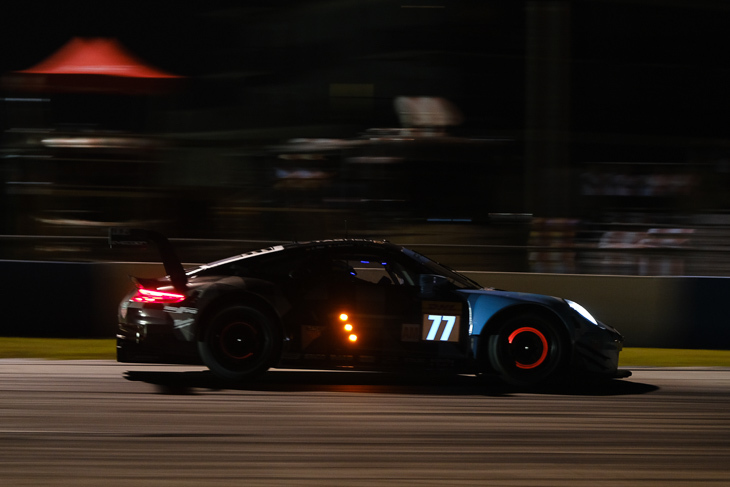 Campbell and teammates Christian Ried and Julian Andlauer matched the pace of their GTE-Am competitors and, other than an excursion at Turn 10 in the final wet laps, stayed out of trouble in their #77 Porsche 911 RSR when others didn’t. The Spirit of Race Ferrari 488 GTE of Giancarlo Fisichella, Franc Castellacci and Thomas Flohr took second in an eventful race that saw them tangle with the eventual third-placed Team Project 1 Porsche, a penalty handed out that may just have spoiled their chance for the win. Team Project 1 itself had a week to remember, preparing a replacement car delivered just in time for Scrutineering and dealing with a multitude of challenges. That their Porsche ran hard at the front in the hands of Jorg Bergmeister, Patrick Lindsey and Egidio Perfetti and showed winning potential is a huge testament to the team’s capability. The #98 Aston Martin Racing entry took several turns in the lead, Mattias Lauda particularly quick here. But a puncture and some debris clogging the rear drive deprived the car of a better finish. An additional note for the Gulf Racing Porsche, which posted improving fastest laps for the class (1:59.989). Thomas Preining had a particularly strong race, partnering the ever rapid Ben Barker and even passing Jorg Bergmeister’s Porsche on track. Fourth place will be a welcome result for the hard-trying Porsche entry.